"Having been referred to Dr Greenberg was easily the best referral of my life." "I strongly recommend Dr. Greenberg"
"I love going to Dr. Greenberg! She really cares about your well being." "She is a really wonderful doctor who takes the time to listen to you and your concerns." "Dr. Greenberg is the most talented and compassionately healing chiropractor I know." "I've been trusting my back and body's well-being to Dr. Greenberg." Dr. Elizabeth Greenberg, DC, is one of the most experienced Chiropractors practicing in Manhattan. She is dedicated to helping patients find natural solutions for a wide range of musculoskeletal issues, injuries pain and stress. Dr. Greenberg is passionate about chiropractic care and wellness and embraces her role in improving the quality of life for residents throughout the greater New York area. Dr. Greenberg received her Bachelor of Arts (BA) from New York University, and earned her Doctorate of Chiropractic(DC) from New York Chiropractic College. Over the last three decades she has been providing preventive and rehabilitative chiropractic care. She is committed to staying abreast of technological advancements. She consistently embraces opportunities to expand her skills and knowledge through continuing education and training in new chiropractic technology and approaches. Her office specializes in non force techniques, which include utilization of instrument adjusting, such as ProAdjuster, Impulse, and Activator Methods. She provides treatment for numerous conditions including sciatica, whiplash, carpal tunnel syndrome, and headaches, as well as many types of musculoskeletal pain. She is also skilled at providing care to pregnant patients, utilizing SOT, soft tissue therapy, and whole body alignment. Whether you come to Dr. Greenberg seeking relief from pain or looking for improvements in wellness, you are treated as an individual, not as a checklist of symptoms. Dr. Greenberg takes the time to understand each patient’s unique set of needs and goals, and she works in partnership with you to create a customized treatment path. Starting from where you are, and getting you to where you need to be. Dr. Rosalie Login is a graduate of Life Chiropractic College. She also holds a Masters degree in Nutrition from NYU, as well as a B.A. in Psychology. She is also a Registered Dietitian/Nutritionist. She has over 20 years experience in caring for patients, using various techniques, best suited for each individual. Dr. Login is committed to helping people get out of pain with progressive and effective, yet gentle Chiropractic care. She believes strongly that with regular chiropractic care, in addition to a balanced diet, adequate sleep, and moderate exercise, everyone can improve their overall health and well being. 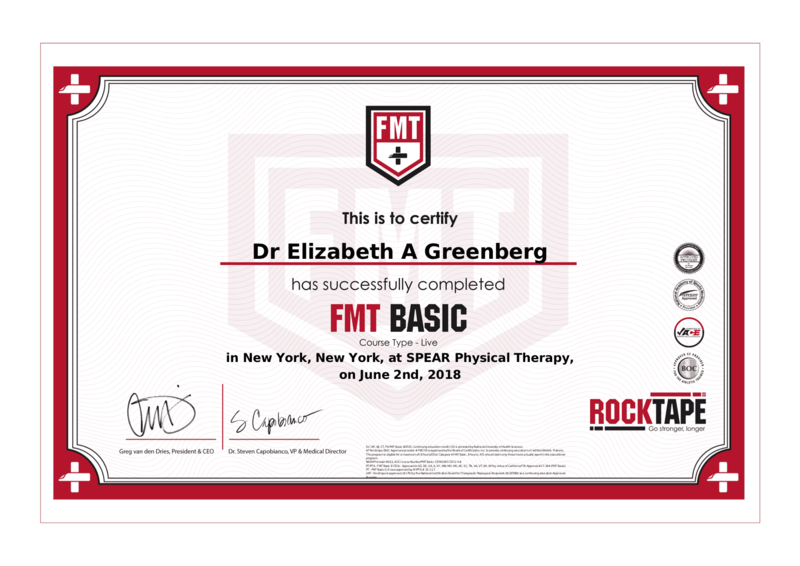 the Rocktape Functional Medicine Taping course in NYC! We accept some major insurance plans. Here are a few of the most popular plans we may accept. Please contact your insurance company to verify you have chiropractic benefits. "My experience with Dr. Elizabeth Greenberg has been wonderful. Her technique is very gentle." "I would recommend this practice to anyone with back pain who is looking for compassionate treatment from doctors who genuinely care." "Dr. Greenberg and her practice manager, Emilio offer warm and supportive chiropractic care in a professional and comfortable atmosphere." "Dr. Greenberg is an exceptional, healing, caring Doctor, that has always taken great care of me." "Very compassionate, skilled, and kind practitioners. They are flexible and attuned to patients' particular needs." Dr. Greenberg worked magic on my lower back pain, which I have been suffering with for far too long. Friendly and efficient office too!